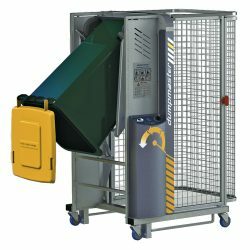 Bin Tippers are a safe and durable solution for unloading bins quickly and easily without physical strain. Bin Tippers are cost-effective, lightweight, and easy to move. Choose from a variety of models with various tipping heights, capacities, and power options. Easily lift and tip up to 143 pounds with a minimal investment. Ergonomically and economically empties 330 pounds in just 20 seconds. Safely and efficiently empty bins and drums weighing up to 660 pounds. Safely tip 550 pound wheeled bins from a raised loading dock. 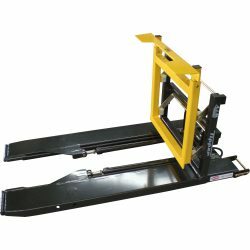 Industrial solution for emptying loads weighing up to 1,300 pounds. Convert an existing forklift into a portable bin tipper. BHS Bin Tippers provide a complete material handling solution for most high-capacity containers, including drums and storage bins of all shapes and sizes. If your industry requires lifting and emptying loads, BHS offers a Bin Tipper to make these tasks safer and more efficient. Three industrial-strength options provide enhanced lifting power in various applications. 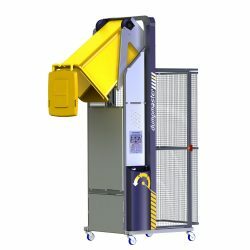 The Ezi-MT™ Manual Bin Tipper (Ezi-MT) is a robust model for standard-capacity lifting, with a safe weight limit of over 143 pounds (65 kg). 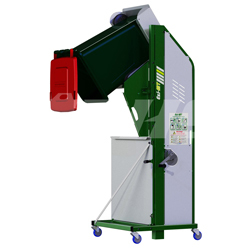 Most common bin sizes lock into this powerful lifter without any additional adjustment. Operators simply rotate a low-resistance winch for lifting, dumping and cradle-lowering tasks. 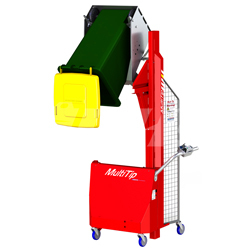 For heavier loads or more frequent tipping needs, the Multi-Tip™ Bin Tipper (MT) is a hydraulic-powered lifting machine with a heavy-duty capacity, easily handling loads of up to 330 pounds (150 kg). 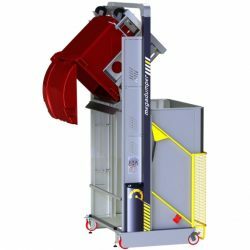 With a standard tipping height of over five feet (1.6m), this model easily clears typical dumpster lids and other obstacles. Custom cradles are available to accommodate nearly any size or configuration of drum or storage bin, making the Multi-Tip one of the most versatile Bin Tippers available. The Dumpmaster™ Bin Tipper (DM) from BHS lifts and tips the heaviest loads. With a standard lifting capacity of more than 660 pounds (300 kg), this durable steel model is well-suited for industrial settings. It is available with corrosion-resistant lifting chains, and optional reinforcement can raise the weight limit to over 660 pounds (300 kg). Dumpmasters can be built with tipping heights over 23 feet (7m). The manual lifting of heavy loads is a leading cause of workplace injury, and the dangers are compounded by the transfer of weight involved in emptying a bin or drum. Bin Tippers prevent the risk of musculoskeletal injury involved in emptying tasks. Unique lift-and-tip motion balances weight transfer for ultimate stability. Guard cages or PET-G panels protect workers from splash during lifting and tipping operations (DM only). Controlled bin lowering safely returns the cradle to ground level. Durable, powder-coated frame is suitable for any environment. The Dumpmaster frame is fully hot-dip galvanized, which ensures powerful resistance to corrosion. Panels protect workers from accidental contact with the lift track. A diverse set of optional safety features are available for particular applications. Contact your nearest BHS dealer to discuss the options or email us at [email protected] For help finding the ideal Bin Tipper for your facility, call the BHS sales team at +1 314 423 2075.